Who can vote on the referendum? Anyone who is a U.S. citizen and is at least 18 years old on or before Nov. 6, 2018 can vote in this upcoming election. You do not need to own a home, but you do need to be a resident of Saint Paul to vote on the SPPS referendum question. If you are not registered to vote, you can register online or on election day at your voting precinct. Learn more about registering to vote here. Why is SPPS seeking a school funding request now? SPPS has cut more than $50 million in the past three years and approved cuts of $17.2 million for the 2018-19 school year. Additionally, federal, state and local funding is not keeping pace with inflation or the educational needs of our students. For example, required special education services cost the District $42 million more than it receives each year, putting additional pressure on the operating budget. How does SPPS�s operating levy compare to other school districts? 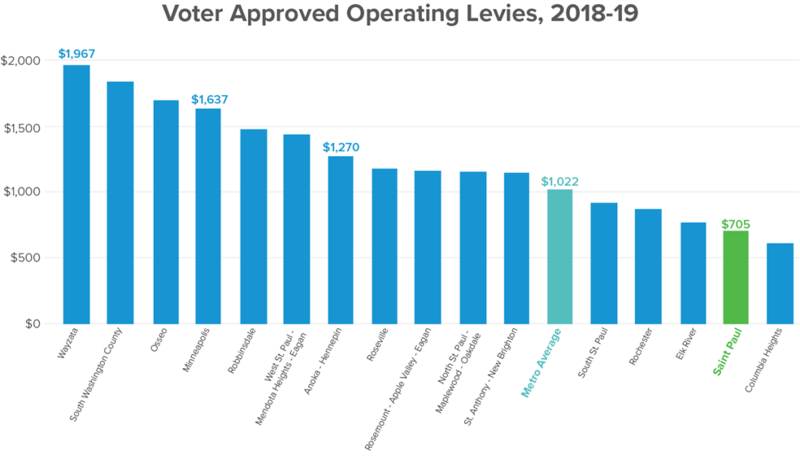 SPPS is the second largest school district in Minnesota, but has one of the lowest voter-approved operating levies when compared to the state's ten largest districts and SPPS neighbors. These levies provide critical funding for classrooms, instruction and other operating costs. View larger image. The state provides the majority of funding for schools, but the next largest chunk is from local communities. State law enables school districts to ask residents to provide additional school funding for their local schools through operating levies. A majority of Minnesota school districts rely on these levies for critical funds for classrooms, instruction and other school operating costs. How does SPPS manage the money it has? What will happen if the voters do or do not approve the levy increase? What are the goals of the Saint Paul Public Schools Strategic Plan? If someone does not vote either way on the referendum, is that considered a �No Vote�? No. A blank vote on the referendum question (no response) is simply not counted -- it is not either a yes or a no vote. Voters need to physically mark either yes or no for their vote on the referendum request to be counted. What did the last referendum pay for? The 2012 referendum funds supported school staff and operations, with a particular focus on needs identified at the time: early childhood and all-day kindergarten, math and reading support, technology-enhanced personalized learning tools, and training and support for students receiving special education and English Learner services. I�m a property owner. Will my costs for the referendum increase each year? If all factors stay the same (state law, property values, student enrollment, etc. ), the only change will be annual inflation adjustments, which has become standard for most school district operating levies. How does the referendum address the budget cuts you�ve been making? These financial pressures make it more and more challenging to provide what our students need and our community expects. Increased funding from the referendum will help us invest more in student needs while limiting additional budget cuts. We will also continue to seek ways to be more efficient and effective in educating our kids, stopping things that no longer work and identifying things that will help us achieve the goals of our Strategic Plan. What is the link between the referendum request and the district�s Strategic Plan? Resources from a successful referendum would help support the work outlined in the Strategic Plan, which we are in the midst of creating based on extensive community and staff input. If voters do not approve the referendum, it will severely limit our ability to implement our Strategic Plan. How the long-term outcomes are supported by focus areas (categories of work to get done). Each focus area has objectives (what we are trying to accomplish) and initiatives (the work we will do to achieve the objectives). This fall, action teams will create action plans for each initiative and also be responsible for their implementation once approved. These action plans will include timelines, performance measures, roles and responsibilities and stakeholder input. View larger image. Does the operating levy increase impact students who attend private and charter schools? Early childhood screening for any pre-kindergarten child who lives in Saint Paul. School bus transportation for approximately 1,000 non-public school students. Additional services for students – such as special education or home-based education due to extended illness – regardless of what type of school they attend. Health services to nearly two dozen non-public schools. Many students may enroll in a SPPS at some point throughout PreK-12 even if they also attend a non-public or charter school. Many non-public students receive early childhood or special education services through SPPS. Research shows that public school quality is one of the most important determinants of home value. How would renters be affected if the levy increase is approved by voters? Because renters do not pay property taxes directly, they may not be affected. Individual landlords who own the rental properties pay for property taxes, and some may choose to pass on any tax increase to their renters through a rent increase. To help offset any increases, renters may be eligible for the Renter's Property Tax Refund. The refund is based on household income and how much property tax was paid through rent, as indicated by your landlord on their annual Certificate of Rent Paid. Learn more here. What is the property tax refund program? The state of Minnesota offers property tax refunds to both homeowners and renters if they meet certain requirements. If your income is below approximately $110,000 (amount set in January of the year taxes are filed). If your property taxes increased more than 12 percent and at least $100 over the prior year. Learn more about the homeowners refund here and be sure to apply if you are eligible ? more than one-third of those eligible never apply. Renters can also apply for a property tax refund. The refund is based on household income and how much property tax was paid through rent, as indicated by your landlord on their annual Certificate of Rent Paid. Learn about the renters’ refund here. Senior citizens may also also qualify for the Senior Citizens Property Tax Deferral Program. Learn more here. What�s the difference between the city, county and school levies? Every fall, the city, county and school district set their annual levies. These levies determine the amount that property taxpayers will pay to help fund each entity’s operating costs. For SPPS, this annual levy certification is a critical part of how we fund our schools, staffing and programs. Unlike the city and the county, school districts are limited by state law as to the amount they can levy each year. That’s why school districts must turn to local voters to approve additional funding through referendums on the November ballot. On the upcoming November 6 ballot is a request to voters to increase the school district’s operating levy for additional funding beyond the annual levy. The city, county and school district each set their own levy percentage increase. However, the percentages should not be added together to determine total tax impact on a home, and the levy increase percent is not equal to the percent increase in taxes paid. You can determine the amount your taxes will increase if voters approve SPPS’ operating levy request by referring to this chart. How does the annual inflation increase on the operating levy work? Learn more about Saint Paul Public Schools (SPPS) budget and how it's designed to support our goals and priorities for students.